Date of increment in revised pay structure.– (1) There shall be two dates for grant of annual increment namely, 1st January and 1st July of every year, instead of existing date of 1st July, provided that a Junior Commissioned Officer/ Other Rank or a recruit shall be entitled to only one annual increment, either on 1st January or 1st July depending on the date of his appointment or promotion or up gradation, or enrolment, as the case may be. respect of a recruit enrolled during the period between the 2nd day of July and 1stday of January (both inclusive) shall be granted on 1st day of July. (m) Revision of pay from a date subsequent to the 1st day of January 2016.– Where a Junior Commissioned Officer/ Other Rank who continues to draw his pay in the existing pay structure is brought over to the revised pay structure from a date later than the 1st day of January, 2016, his pay from the later date in the revised pay structure shall be fixed. 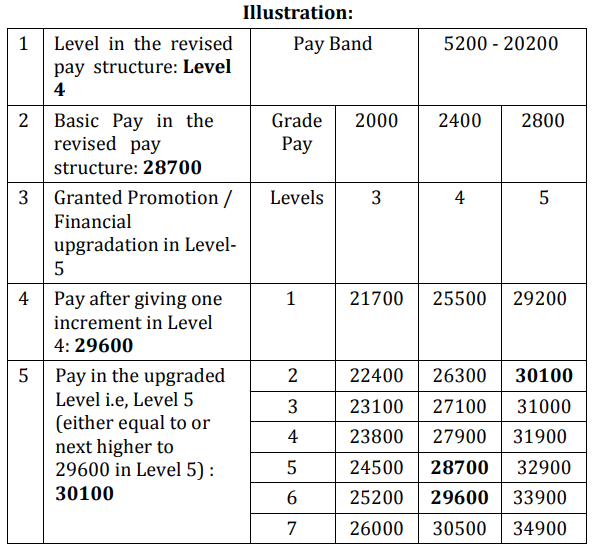 (n) Fixation of pay on promotion or up gradation on or after 1st day of January, 2016.– For the fixation of pay in case of promotion or up gradation from one Level to another in the revised pay structure one increment shall be given in the Level from which a Junior Commissioned Officer/ Other Rank is promoted or upgraded and he shall be placed at a Cell equal to the figure so arrived at in the Level of the rank to which promoted or upgraded, and if no such Cell is available in the Level to which promoted orupgraded, he shall be placed at the next higher Cell in that Level.